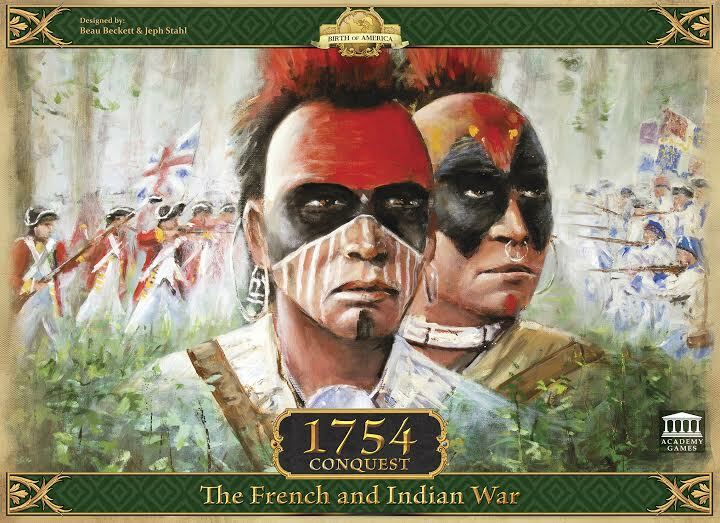 1754 Conquest: The French & Indian War, the latest in Academy Games’ Birth of America Series, manages to bring the familiar game play of its predecessors, but with enough differences to make purchasing this historical gem worthwhile. 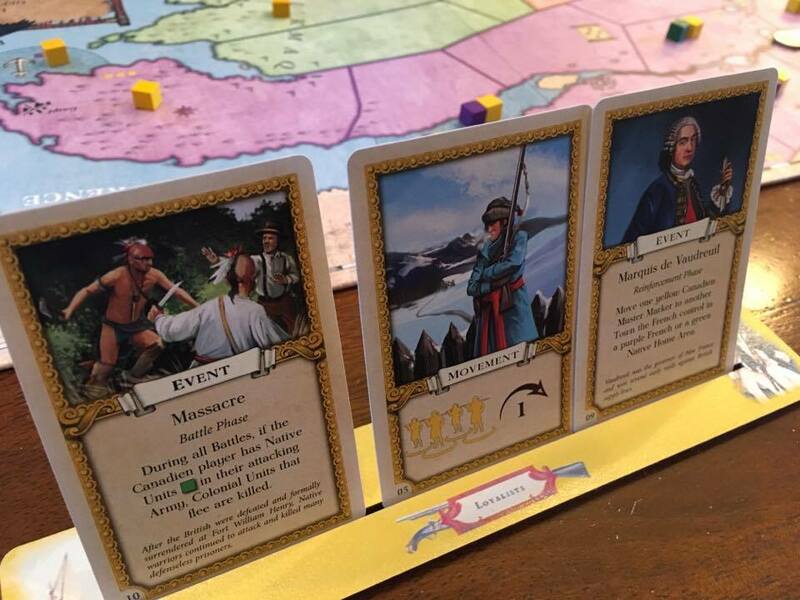 If you’ve played and enjoyed 1812 Invasion of Canada or 1775 The American Revolution, 1754 Conquest will immediately make you feel at home. With its predecessor’s core system of card play, combat and maneuvering intact, a veteran of these games will be up and playing after a quick read through of the rule book. 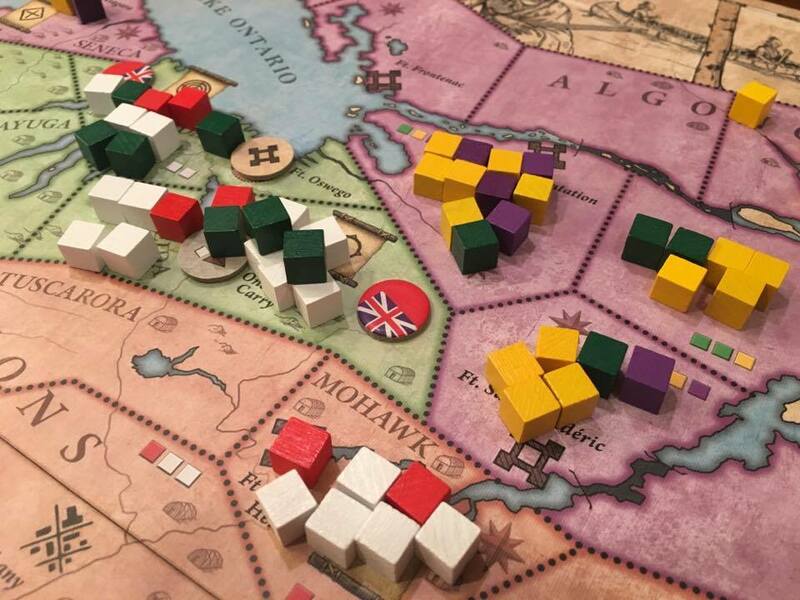 If you haven’t played any of these games, you are in for a treat, and you can expect to feel comfortable with the well-written, example-filled rules and historical commentary. 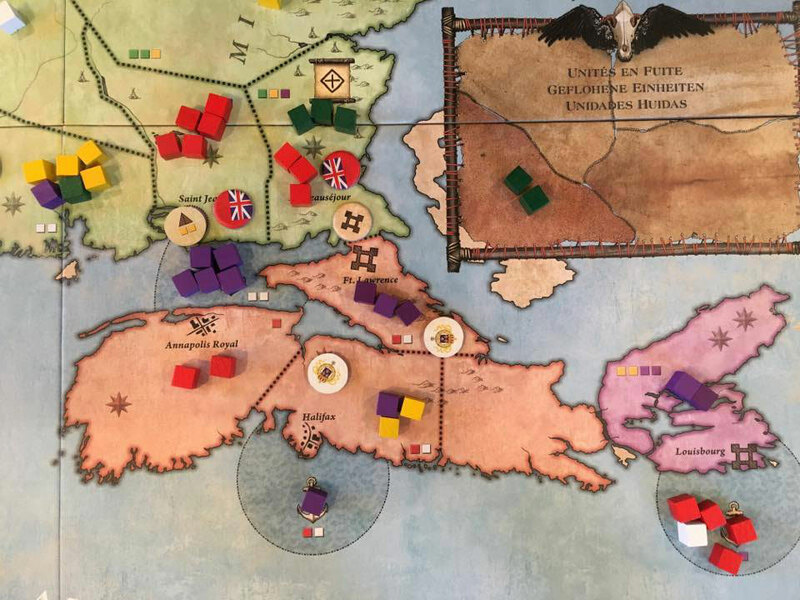 With each iteration of the Birth of America series, designers Beau Beckett and Jeph Stahl have managed to incorporate a number of changes that reward players with challenging new strategies and historical battlegrounds on which to test them. 1812’s map board depicts a line in the sand which results in a game of back-and-forth incursions into each side’s territories. 1775 is nearly the antithesis of this approach with a mottled distribution of units throughout the colonies and coast, resulting in an often challenging, unpredictable flow of battle and tenuous defensive positions. 1754 Conquest finds the middle ground, pitting the British Colonials and Regulars on the east coast and French Canadians and Regulars to the west. But this is not another line in the sand. The Native American nations predominantly separate the two sides, leaving ample room for creative maneuvering, and there are just enough of each side’s units in close proximity to ignite hostilities early on. All of the games in the series end with the play of Truce cards. When a side’s final Truce card is played, the game will be over at the end of the round. 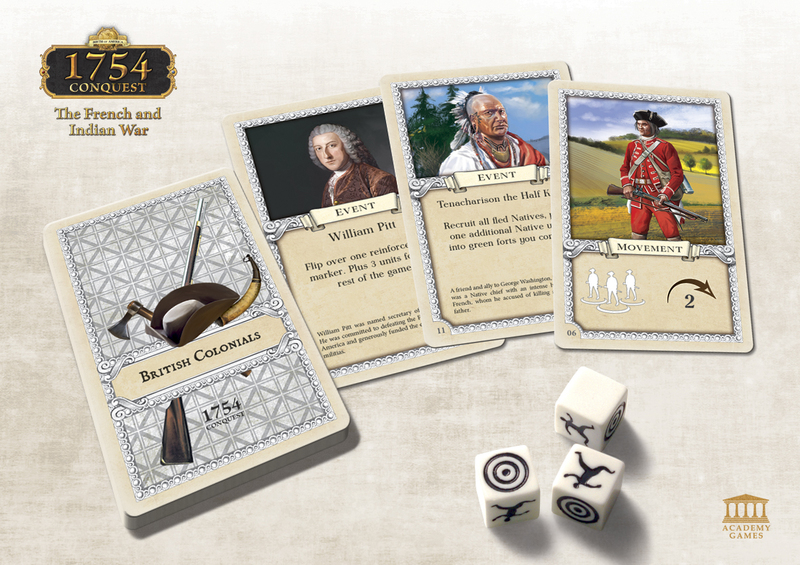 Other than simply fighting a battle from American history, the Birth of America series incorporates historical events from the time periods each game represents, and 1754 is no different. The British player can expect to find in his mix of cards Joseph Brant, one of just a few Native Americans to be awarded the Silver Medal for his participation. 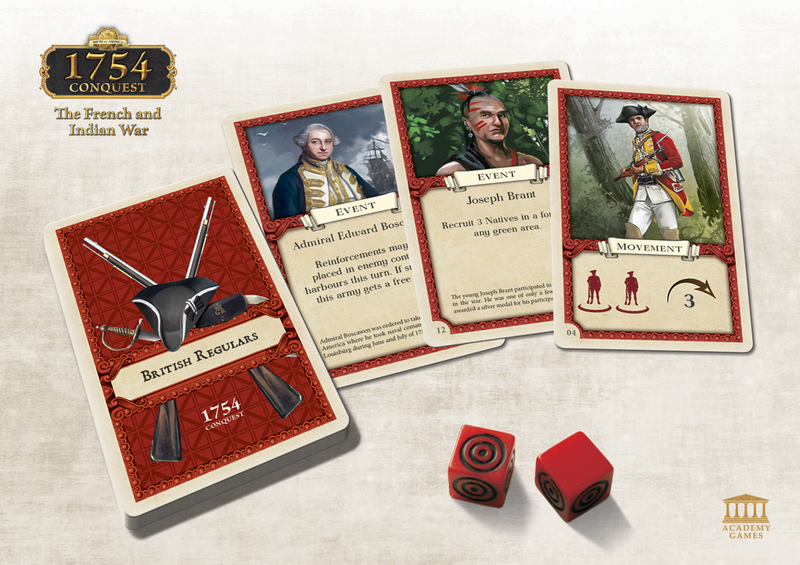 Brant’s event card allows the British player to bolster his forces with additional Native American units. Among others, the French player has The Entreprenant event. The Entreprenant was a 74-gun sailing ship that took part in the reinforcement and defense of New France. Playing this card allows the French player to place his reinforcements in an enemy-controlled port and fight an immediate battle outside the normal sequence of play. 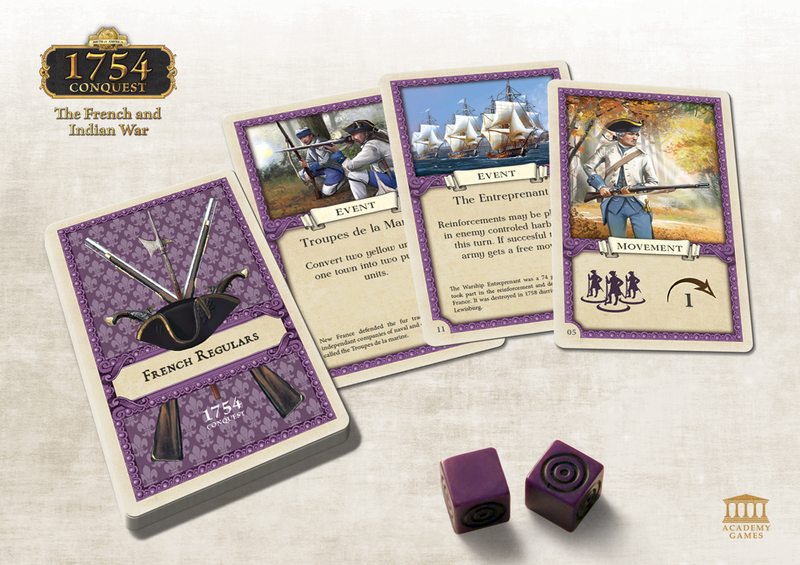 Each playable faction in the game — British Regulars, British Colonials, French Regulars, and French Canadians — comes with four of these historical events in a deck of a dozen cards, the remainder of which are used for movement. Native American units are also featured in 1754 Conquest, representing the Six Nations. They will join whichever side happens to enter an area they control, and they’ll move and fight alongside you. Rounds in 1754 Conquest are driven by pulling a faction die from a bag to determine turn order. This mystery not only adds tension, but often serves as the foundation to your strategy. You’ll often consider whether to dig in and shore up your territories, or press ahead hoping your second faction will go next. And there’s always that rare chance one side’s factions will have four turns in a row, going last one round and going first the next! 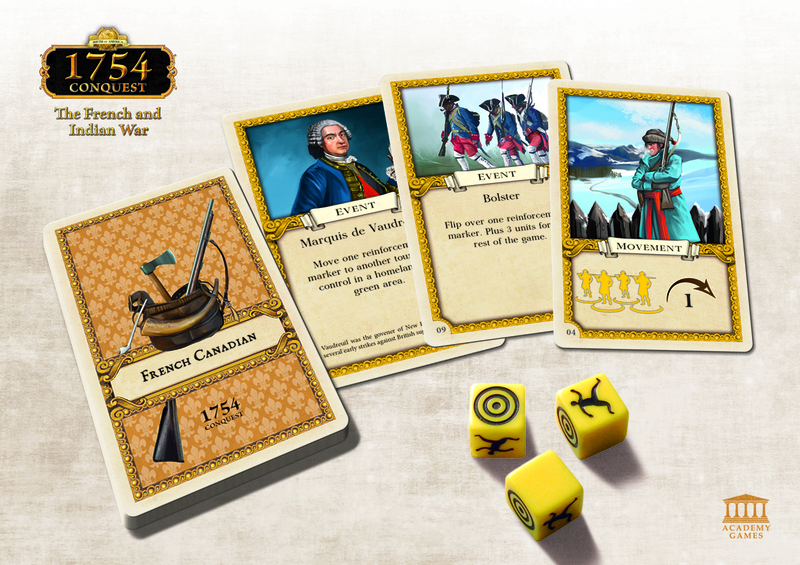 Reinforcements for French and British Regulars appear in friendly-controlled ports to the tune of four cubes per turn. The Colonials and French Canadians have less flexibility and only appear in one of two Muster Areas per faction. Muster Areas are a new addition to 1754 Conquest. Since the distribution of French and British Regulars is locked into these Muster Areas, pre-game placement of the muster tokens makes for an interesting decision. For example, you may never see another yellow French Canadian unit (aside from those placed during setup) in territories that are located far from a Muster Area. This is important to note, because the more diverse your armies, the more dice you roll during combat. While Native Americans are not a playable faction, they also get a turn each round. Depending on which turn space they occupy, three Native Units are placed on each of the two areas that matches one of the five unique turn symbols on the turn track. Movement rules are simple, which are announced by playing a card that depicts a number of armies and how far each can move. A major difference in 1754 Conquest is the exclusion of boat and ship movement cards, and this proves to be a welcome change due to the prevalence of ports. 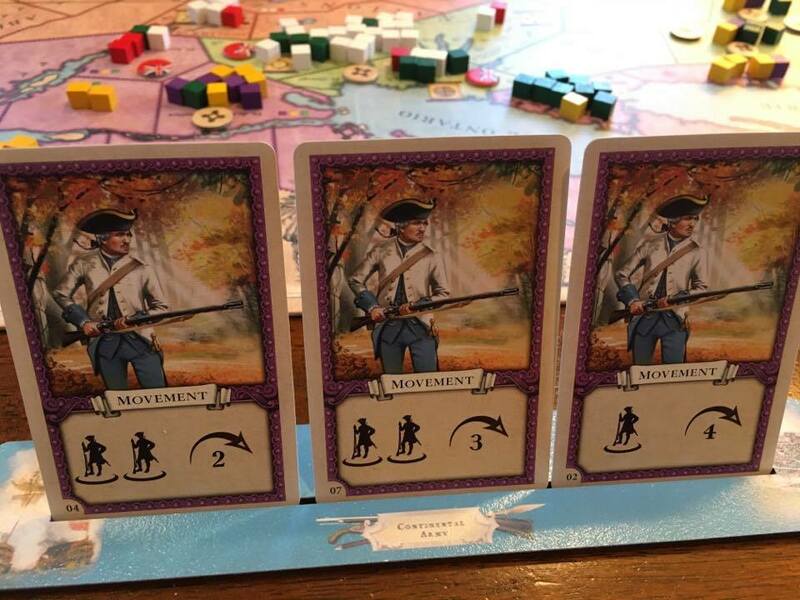 Simply, moving by water and land is now allowed with the play of any movement card by the British or French Regulars, cracking wide open the strategic possibilities! Opposing units that share the same area fight it out until one side remains. The beauty of the combat system lies in its ability to induce interesting results and decisions through Flee and Command Decision results. Rolling a Flee result affects your side’s own units, forcing you to remove a unit (matching the color of the die) to the Fled Unit’s box, which will thankfully return to a Muster Area on your next turn. Only French Canadians and British Colonials can expect to see Flee results on their dice. In fact, they run away 50 percent of the time, so don’t count on these guys to do all of your dirty work! Command Decisions (rolling blanks) gives the player the option to move a number of of his units out of combat and into an adjacent combat or to a friendly or unoccupied area. Of course, the player can also decide to remain. Command Decision results are a welcome result for either side. If your rolls are going badly, you can begin retreating units. If things are going well, you can pull back units that are no longer needed or press them onward into adjoining battles. If Native Americans are joining both sides of a battle, they immediately cancel each other out in equal numbers! Battle lines are fluid in 1754 Conquest, and keeping your opponent on the defensive tends to be a sound strategy. In doing so, your opponent will tend to spend more time shoring up to prevent further losses, or building up, making his next incursion more obvious. Another new addition to 1754 Conquest is Forts. Each side begins the game with three of them, and if you’re defending with a Fort, you get to roll the Fort Die, which will block a hit 50 percent of the time. While that may sound minimal, I can assure you that Forts have proven to be the difference maker in countless battles. Perhaps that’s why a defending unit has the option of burning it down when leaving battle with a Command Decision. If I can’t have it, no one can! Thankfully, each side has a card that allows for the construction of a new Fort. There is also an interesting alternative setup that allows players to choose all of their own starting Fort locations, instead of those printed on the board. 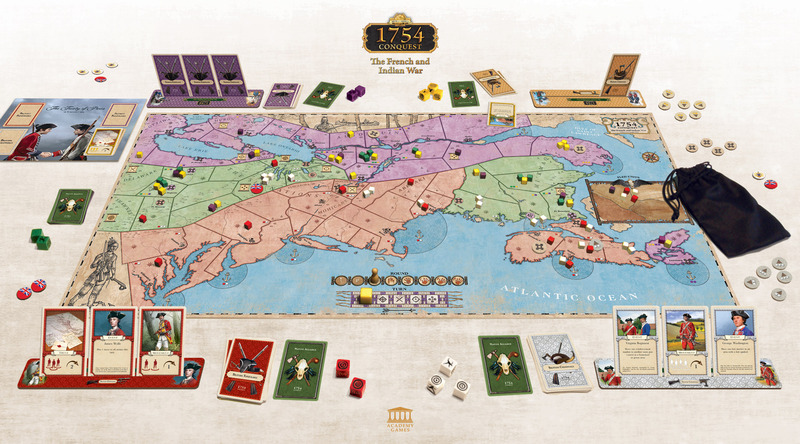 1754 Conquest brings the Birth of America series to a satisfying conclusion. Card-driven game play guarantees each game will be different from the last. 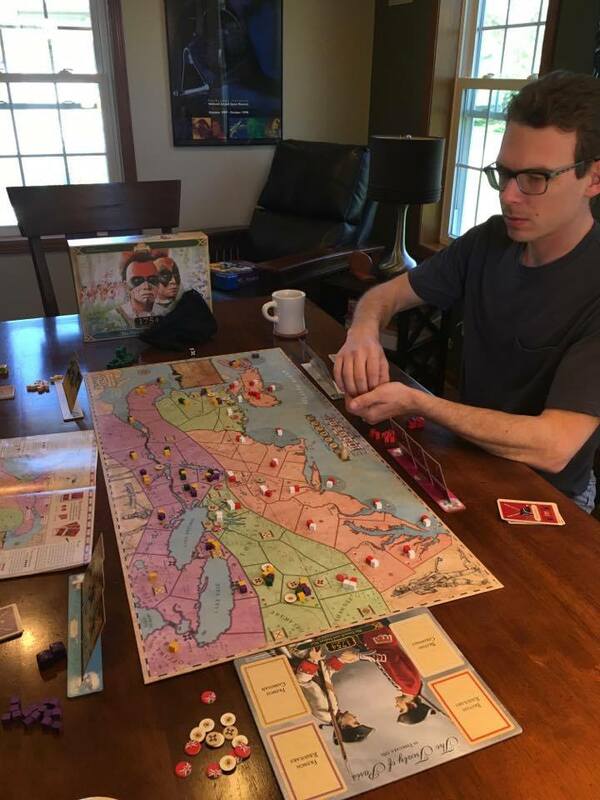 With myriad decisions and strategic possibilities on both sides, there’s never time to get comfortable in 1754 Conquest as you attempt to take and hold more territories than your opponent. In our experience, most games conclude with a small margin of victory, which is another plus. Who doesn’t like a close game? Most games take about two hours to play, and you can teach it to a friend in about ten minutes. 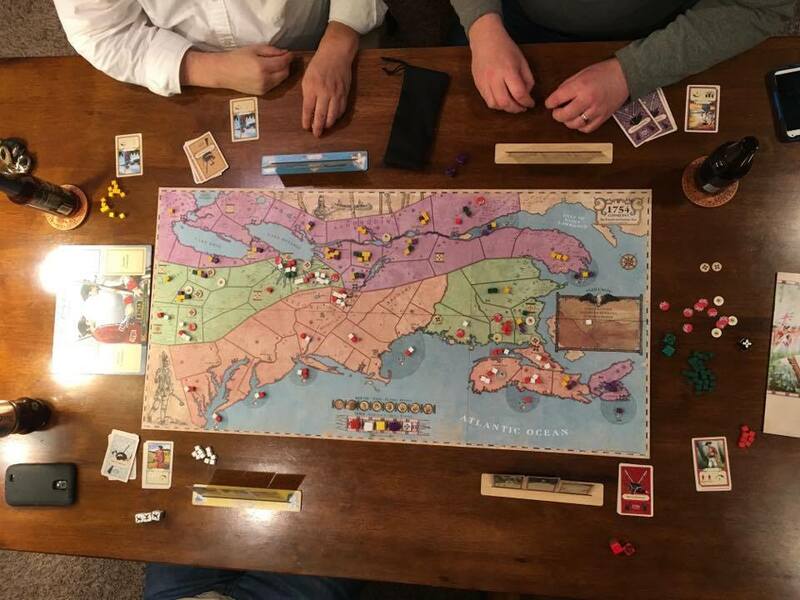 Finally, the addition of Forts, Muster Areas, revised sea movement rules, new map (of course), and variable reinforcement of Native Americans all work toward bringing a remarkably fresh and enjoyable installment to the already familiar game play in the Birth of America series. 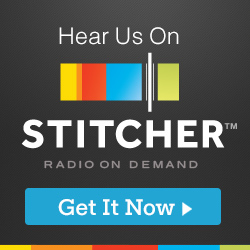 The Board Game Show plays every game we review many times before beginning the writing process. Here is a picture of one of our four-player game sessions. A number of two-player games were also played.